You must make reservations at least 5 minutes in advance of the time at Cafe Ginger - Uptown. We also offer complimentary free garage self-parking to customers. Please bring your ticket to the restaurant for validation of free parking. 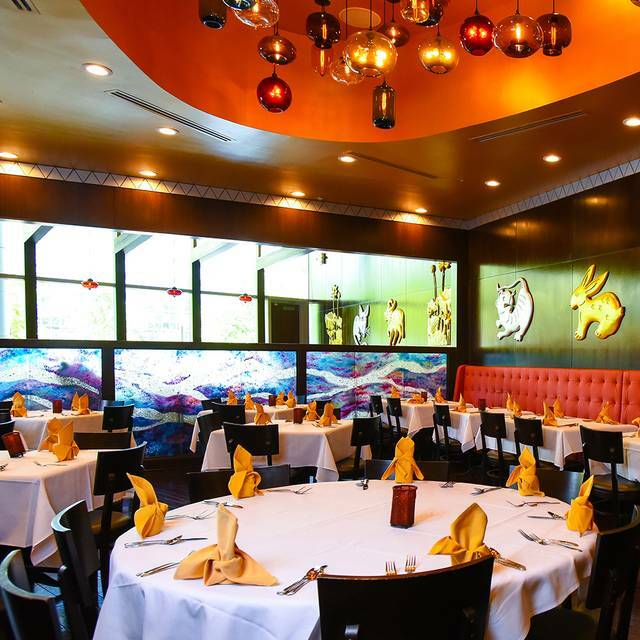 Cafe Ginger Uptown is one of Houston's best, and upscale Japanese-Chinese fusion restaurants. We offer catering, reservations, party hosting, and deliveries. Look forward to our top quality, hand prepared sushi dishes, complimented with a side of delicious Chinese-traditional foods. Fresh green beans, dry sauteed with soy sauce, Szechwan pickles and jalapenos served with a side of pickled ginger. Fried tofu, wok tossed with mushrooms, asparagus, broccoli, bok-choy and snow peas in house brown sauce. Sliced beef tenderloin sauteed with white onion and scallion in our sweet brown sauce. Sliced beef tenderloin sauteed with fresh button mushrooms, white onions, bell pepper and jalapeno in our signature Beijing sauce. Crispy soft shell crabs, dusted with salt and pepper, lightly fried then dry sauteed with scallions and jalapeno and topped with fresh cilantro. Jumbo prawns, dusted with salt and pepper, lightly fried the dry sauteed with scallions, jalapeno and topped with fresh cilantro. Strips of pork tenderloin sauteed with fresh button mushrooms, bell pepper, white onions and jalapeno in our signature Beijing sauce. Tender pork wok tossed with jalapeno, onion, bell pepper and mushroom in tangy peppercorn sauce. Lunch is a busy and rather noisy time, but we were seated immediately even though we were a bit early for our reservation. After 1 PM the noise level calmed down. The flower tea was good to share and visually appealing with its glass carafe kept warm on a tea light. We especially enjoyed the BBQ eel on rice. Wait staff was so accommodating and allowed one in our party to exchange the soup in the lunch combo for an extra spring roll. Try the spicy shrimp and eggplant entrée! A generous serving of green tea ice cream was plenty to share and not too sweet. The décor is upscale for a Chinese/Asian restaurant, but fun. The service was too rushed. We were not even half finished our appetizers when our entrees came. It was not crowded so this was annoying. Great service and delicious food. Always a pleasant dining experience at Cafe Ginger! Awful service. Nobody pays attention to you and your order. I love everything about this restaurant - great food, excellent service by the manager and staff, elegant ambiance. In addition, their outdoor sitting area is awesome! And I also liked their mochi ice cream. I highly recommend this restaurant. Great place. Food was good. Service was a bit too slow and she got the ordered wrong twice. Always good and dependable. I actually prefer the other Café Ginger on West Grey as it seems a bit less pretentious and you can self park (versus valet for a fee). This place is very popular so the noise level at lunch was pretty loud. The service was prompt, attentive and kind without hovering. The soup was hot and delicious and I enjoyed that. The hot green tea was good and the serving staff circle with refills which was great. The only thing I would change was that my lunch was not hot enough for me when it was received. I did not send it back this time because I was pressed for time, so that's on me, but next time I would ask for it to be reheated or replaced. Otherwise I enjoyed the restaurant as did my guest. This was our first time dining at Cafe Ginger and it won’t be our last. The food was very good and the attention to detail was great. They truly care about making their customer happy. The restaurant was very inviting and very clean! Great food, great service and great atmosphere!!! I highly recommend it!!! We were shocked to find out that the waitress was not aware of which plates had MSG and we were shocked that they used MSG in many of their food choices. They seemed to be very disorganized as our table was not ready so they put us in the private room which was nice and quiet. It just seemed that they had some very inexperienced individuals who were not organized. We enjoyed our evening once it got going. The food was very good but we had to change a few because of the MSG. We assumed that Chinese resturants had limited their use of MSG as so many people have bad reactions to it. We have been there before and did not have the same problem. Why not print MSG next to the menu items. That would solve a problem for you and the diner. Food was bland compared to other Asian restaurants and pricey for portion. Our lettuce wraps were the best item. While Nygiri and Sashimi were excellent, the calamari was dismal and shrimp tempura tasted as if it was cooked in concrete. Duck appetizer was above average. When they brought our food to the table it was very nice looking however everything was cold. Even the main course was cold when served. When people call for directions you need to say next door to Caracal. We drove all over the neighborhood before we finally found your location. You won't loose any business to Caracal. They serve a different clientele. We had a family get together for 7 adults and 3 children. The staff gave us a private room we didn’t even request and went above and beyond with great service. Such a wonderful evening. This was me and my wife's time to Cafe Ginger. We came for a special date night and we were not disappointed. The food was amazing and the service was great as well. Our server was very friendly and professional. We will definitely be back!! Got order wrong. Service not very good. All food was over cooked and dry. We eat out all the time but don’t believe this is a do again. The soft shell crabs are always delicious. Never disappoint! This is my favorite lunch spot. I can always count on delicious food and great service. We celebrated my coworker bday and they made it special. I love this place. 2 kids and 2 adults and waitress was outstanding. Was great! Thip(server) was amazing. Food was great! Our server (can't remember her name) was hilarious. We had a great time. Robin really elevates our dining experience! She is such an asset to CAFE GINGER! Food is so delicious and fresh! The food was great and the service is always good...great for outdoor eating. Eclectic atmosphere with inspired Chinese food. Sushi also with nice happy hour food and drink offerings every day. The service and food are always good. The front desk people are always welcoming also. Loved Cafe Ginger! Great food and service. So glad they’ve come to Uptown We’ll definitely be back soon.